Deep-fried modak are obviously deep-fried in oil, unlike the steamed Modak. The shell of the deep fried modak is made from whole wheat flour and the stuffing is traditionally jaggery and fresh coconut. The fried modak last longer and taste different. Also unlike the Ukdiche modak where you get the finesse after practice, this modak does not need it. 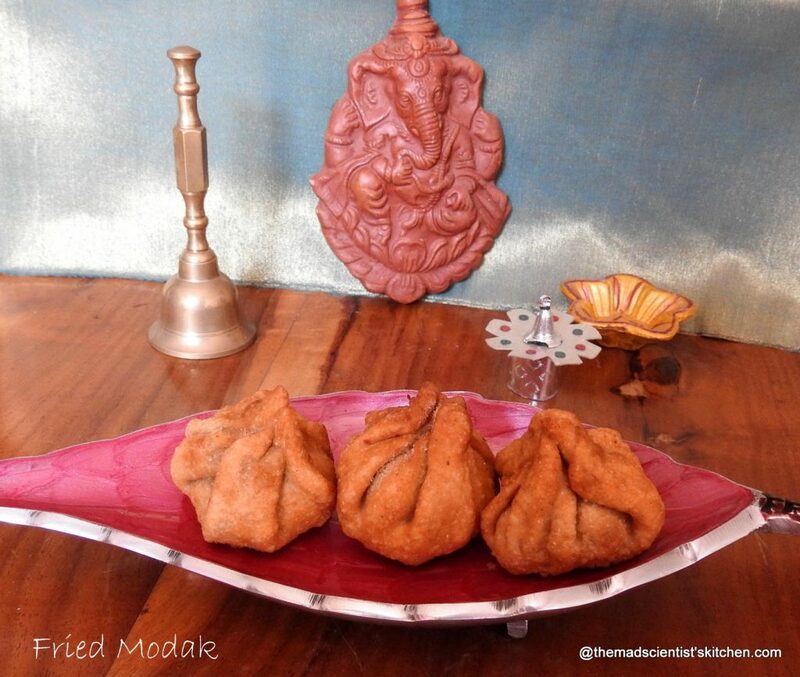 A modak (Marathi: मोदक) is a sweet dumpling popular in Maharashtra, India. Modak is common in Marathi, Konkani and Gujarati language. In Malayalam, Kozhakkatta (കൊഴുക്കട്ട), modhaka or kadubu in Kannada, modhakam or kozhakkattai in Tamil, and kudumu in Telugu. Quite a few names and why not it’s a yummy tasting dish and hence very popular. Generally, the sweet filling inside a modak is fresh grated coconut and jaggery. The shell varies a modak can be made from rice flour, or wheat flour and maida flour. The rice shell dumpling is steamed. This steamed version is called ukdiche modak eaten hot with ghee. The wheat flour ones can be steamed or fried; in case they are steamed, they have to be eaten hot again with ghee. 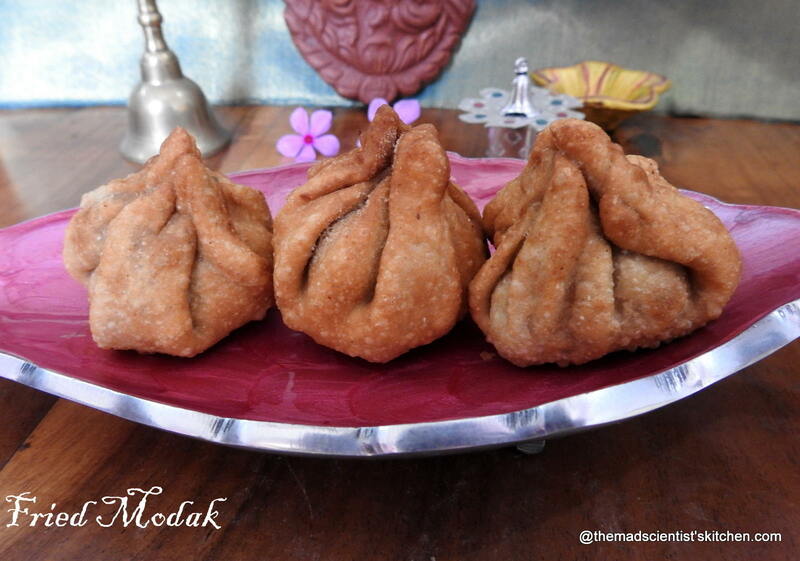 Modaks have a special importance in the worship of the Hindu god Ganesha;modak is believed to be his favorite food, which begets him the moniker modakapriya (the one who likes modak) in Sanskrit. During the Ganesha worship ceremony, known in Maharashtra as Ganesha Chaturthi the puja always concludes with an offering of twenty-one modaks to the deity and as prasadam. Modaks made with rice flour shell are preferred for this purpose, however, wheat shell version are also used. Innovative recipes for modaks have also been created. These include banana nachni modak, motichoor modak and chocolate modak. I was surprised when my girls liked Ukdiche Modak so I went ahead and made the deep fried ones. One more addition to my Ganesh Festival List. In a thick bottomed kadhai/wok mix the jaggery and coconut. Cook on a low or medium flame till the mixture is dry and cooked. You will have to stir the mixture. Mix the salt and the wheat flour and 2 teaspoons oil well with sufficient water to make a smooth dough. Apply the last 2 teaspoons of oil over the dough. Cover and keep the dough aside for 20-30 minutes. Make 10-12 small balls from the dough. Roll one at a time thin in a circle. In your palm place, the circle add the filling in the centre. Pinch the edges to form a cup. Bring the pinched edges together in the centre. Seal well you do not want the modak opening up in oil. Deep fry the modaks in medium hot oil till golden browned. Use 1-2 tsp of rava in the dough the shell is crisp. In case you wish you can use 1 cup of maida or APF and one whole wheat atta to make the shell. Will try this way Padma. By daliya you mean what we call puthane or fried gram? Never tried my hands with fried modaks, planning to make some for this year’s ganesh chathurthi, let me see. Happy to see you back after a long Archana. The fried version is always my favorite!..I was expecting Santhranti special and you are reminding me of Ganesh Chaturthi..:)…but then why not, this can be made anytime..the filling looks very sinful Arch. Not taking anymore risks Valli. Lost everything second time. Better begin with a prayer. Never tried deep fried modak, yours look so delicious. The fried modak is a treat , the stuffing sounds yum ! This one is my favorite.Wish I could have a few now. Yummy looking fried Modak Archana. I’ve tried the steamed variety but not the fried ones. Will have to try these some time. We make this fried modak for ganapathi homam and my boys literally snack on these all day. Lovely beginning to the New Year Archana! Modak and deep fried that is double deliciousness. LOve this dessert.. perfect for festive time..
Looks delicious and took me back to my memories of Ganesh Chaturthi celebrations when we lived in Bombay! Your recipe looks simple and delicious. 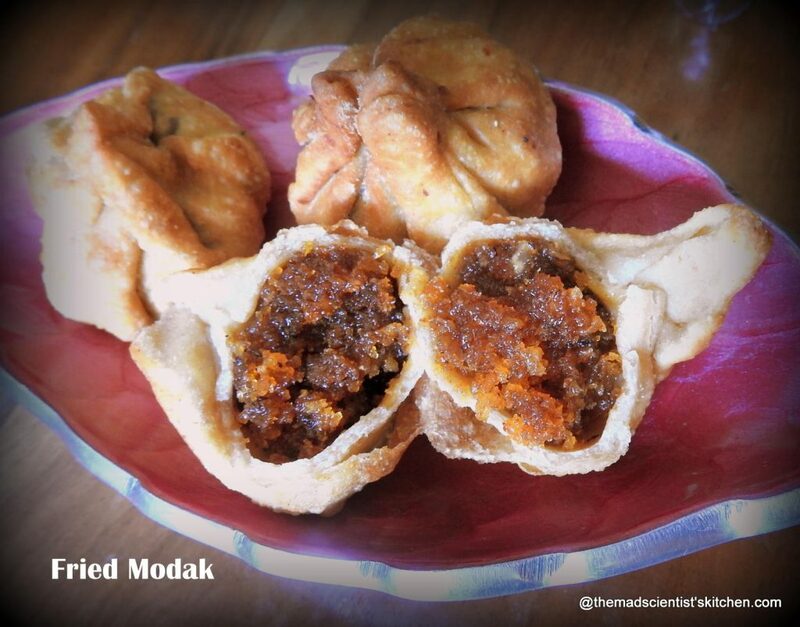 Wow would love to try this, seeing everyone making modak, I am dying to do , but do not have a modak mould. Loved your deep fried modak’s and the filling in side it. Renu you do not need a mould to make modak. Do try it. Really! Somehow I cannot believe it. You must try.